I renamed it “Market economy that cares for the poor is possible” as it echoes some of my thoughts on the mining industry. In late February, President Jakaya Kikwete of Tanzania gave a speech to mining sector stakeholders that caused a mighty uproar in the press. Speaking at Dar es Salaam’s Kilimanjaro Hyatt Hotel to launch the Presidential Award on the Extractive Industry Corporate Social Responsibility and Empowerment (CSRE) programme, the president was quoted as saying, ‘it’s disappointing to see some mining investors want to benefit alone… leaving the government and surrounding communities with nothing,’ he said. ‘If companies pay taxes that are due to the state… they will have good relations with the government,’ he added. In a tone that was described by onenewspaper as ‘serious,’ he called for the creation of better linkages between the industry and other economic activities in the country. He said he was baffled by reports that mining companies choose to import goods from abroad that can be easily found in the country. “People… ask, “what do we get in return? Our gold is taken, companies have tax holidays and exemptions, [yet] they don’t even buy our goods or support us economically,”’ he said. The speech and its perceived critical tone, especially, was unexpected. Reading the coverage, one would have been forgiven for mistaking the president’s comments for the kind of rhetoric usually associated with activists campaigning against perceived misdeeds by the mining sector. 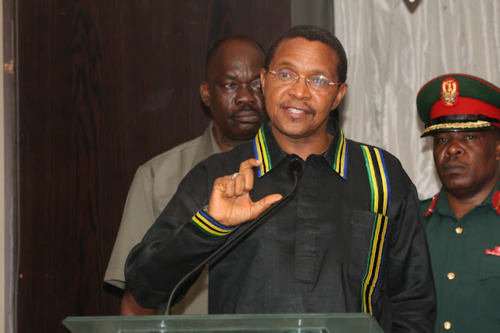 Mr. Kikwete was not only co-opting their message but in many ways he sounded like he was channelling their anger. Meanwhile, the way the story unfolded in the media showed how narratives about the sector evolve and enter our public discourse. It began with the president giving what the media interpreted as a critical speech about the industry, which was then echoed by an incendiary press who amplified it to their readers who will, with complaints to public officials, in turn reinforce the anti-mining sector arguments. The storyline seemed to subscribe to the now familiar trope of “foreign investors unbridled in their plundering of our resources while local communities benefit little from what is rightfully theirs.” That’s the narrative that dominated Tanzania’s newspapers and airwaves. However, in the media coverage that followed, conspicuous in their absence were voices from the mining sector explaining or offering an alternative perspective. But a couple of weeks after the President’s speech, the industry body, the Tanzania Chamber of Minerals and Energy, granted me an e-mail interview, presenting a different narrative to the one carried in the press earlier in the month. The chamber strongly disputed what they termed as an ‘outdated characterisation’ of the industry, arguing that mining is ‘driving socio-economic development both in Tanzania and across the African continent.’ While they disagreed with the media’s spin, saying that reading the speech in its entirety would show how supportive of the sector President Kikwete is, they were also quick to emphasize what they believe are significant contributions mining brings to Tanzania’s economy. As to the question of whether there exists linkages between the sector and the country’s overall economy, TCME calls attention to the activities of one of its biggest member, African Barrick Gold (ABG). The chamber says ABG currently employs 9,200 people whose wages amount to US$148 million, a chunk of which, they argue, drives spending in the local economy. In 2009, for example, the chamber argues, ‘through employment, taxes, royalties, and local procurement, roughly 70% of African Barrick Gold’s revenue was retained in the Tanzanian economy.’ They also point to ABG’s community development spending, which, they say, through its ‘Maendeleo Fund’ ‘provides US$10 million annually…to support communities [surrounding] the mining areas.’ In addition to this, TCME claims that ABG, ‘spent more than a half a billion dollars purchasing goods and services in 2010 of which 59% were made in Tanzania.’ All this, they say, demonstrates just how ingrained in the economy modern mining firms are. If these figures are indeed true, why is it then that the mining sector is a target of so much suspicion and vitriol? Some industry observers complain that the absence of easily available information about the sector has created a perception, justifiable or not, that mining companies are too secretive, which then feeds the idea that they have something to hide. ‘Secrecy surrounding financials and taxes in the mining sector exacerbate the views expressed by the President,’ says Zitto Kabwe MP (Chadema – Kigoma North), the Deputy Leader of the Opposition in Parliament and the Shadow Minister of Finance. His colleague, January Makamba MP (CCM – Bumbuli), the Chairman of the Parliamentary Committee on Energy on Minerals, shares this view and says that at the moment, ‘the asymmetry of information favour[s] these companies.’ Both parliamentarians agree that when it comes down to it, Tanzanians simply want to see their country get a fair share from their natural resources. When looking at the sector’s tax contribution, Mr. Kabwe argues that this too could be improved. ‘Taking the proportion of the taxes companies are paying to total export of minerals, you will realize that the government receives peanut[s], around 13% only,’ he says. Furthermore, Mr. Kabwe argues that most of the taxes mining companies pay do not originate from the companies but come out of employees’ pay cheques. ‘It is true that mining companies pay various taxes. However, most of these…are originating not from companies, but, for example, [from] employees’ [Pay As You Earn] taxes and companies are simply collecting agents,’ he says. Just like Mr. Kabwe, Mr. Kilonzo insists that the way to remove doubts about the sector is to make all payments and contracts public. ‘Secrecy creates public discontent and mistrust of mining companies of which populist leaders are compelled to react to.’ Consequently, without an open and honest dialogue, ‘that discontent is bound to continue,’ argues Mr. Kilonzo. But the chamber says it wants to hear from those critical of the sector and is interested in listening to what they have to say. ‘We want to be able to engage in a dialogue that will help us to better understand the concerns and needs of our stakeholders,’ they say. At the moment, though, that conversation is struggling to take place. It seems like the politics of mining, and the extractive industries in general, are drowning out any sensible and dispassionate look at the economics of the industry. So, it appears that, once again an economic debate finds itself taking a backseat to political tactics. ‘Perhaps the President is hedging, anticipating a long but losing battle with the various parties that will be involved regarding oil and gas,’ says the analyst. For his part, Mr. Makamba suggests that while politicians are justified in responding to the general public’s sentiments that Tanzania should get more from these investments, they need to be careful they don’t veer too far into populism, which in the end could stifle ways in which the government and the sector can work together for mutual benefit. ‘I think that the characterisation that mining investors “want to benefit alone” may be a bit harsh,’ he says. At the same time, it is unclear whether mining companies appreciate the political dynamics at play in the country. Tanzania, after all, is a former socialist country and that spirit and its accompanying suspicion of private enterprise still retains a powerful hold on the country’s politics. TCME are at pains to explain how the industry and the government need to work together to make sure the benefits of mining are clearly understood by all. But observers, argue that the sector needs to be more proactive and open in articulating what its contributions to the economy are. In 2010, civil society leaders worked with Parliament to improve Tanzania’s mining legislation. This short film for Revenue Watch International depicts a remarkable band of advocates whose collaboration, political savvy and skilled engagement shows how local leaders can draw on outside allies to make change possible. Members of parliaments across Africa are the key actors in the drama, as resource-rich countries struggle to gain a better share of mining wealth. Revenue Watch International provides the tools and the expertise for counties to win the benefits of contract transparency for citizens and governments. Starring parliamentarians from Sierra Leone, Ghana, Tanzania and Uganda.